I’m sort of used to getting letters from Lord March’s office that are printed on papers thicker than the boards of your average IKEA furniture, but Morgan just put this game to a whole new level, using lacquered wood, aluminum, paint and four screws. 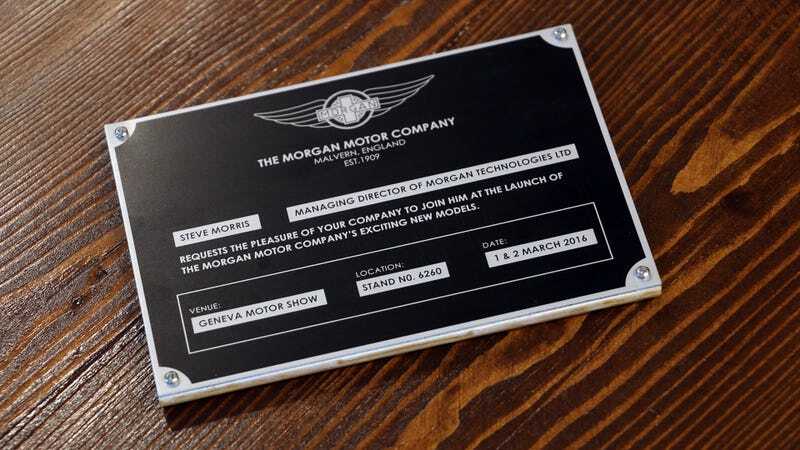 Morgan will present its first electric vehicle, the EV3 at the Geneva Motor Show while also celebrating the 80th anniversary of the Morgan 4/4, the longest-running production car in the world. The opposite poles of their lineup. Unsurprisingly, when I try to set up an interview with a non-British manufacturer, I usually end up exchanging a few emails with their crew, and by the end of the day, our calendars are synchronized without any printers getting involved. When it comes to the British, we still set up everything through emails, but then, they sometimes ask for my office address. And a few days later, I get an official invitation made of materials you can use to build shelter with, or a Morgan with.